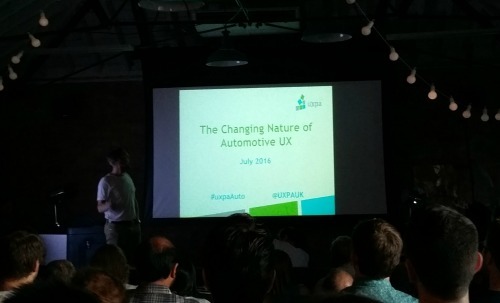 This months UXPA meeting was called The Changing Nature of Automotive UX, hosted by Unruly and curated by the HCDI team at Brunel University. I turned up expecting a set of talks about self driving cars, but ended up with something much more interesting. First up was Professor Joseph Giacomin, who spoke about Brunels AutoHabLab, which looks at how a car is a habitat and how we live in that habitat. I was very interested in his thoughts on people's expectations and how if people see these ideas enough in 'Real Fiction' they will accept them when they finally end up in their hand; think about how similar the Star Trek communication tools were to our first smart phones. He also spoke about how driving in different contexts will change what you need your car to do for you, which sounds rather obvious when said like that, but if you just ask people what they want from their car they will give you a different response depending where they are driving, for instance in the city versus on the motorway. Next up was Rhodri Jones who works for Bentley. It takes them 48 months to design a car and they only make 12,000 a year. Their design challenge is different from designers who work on more common cars, for instance their high end cars tend to be chauffeur driven with the customer who bought the car sitting in the back. And when working on their sports car there is very limited space for screen technology which must compete with things like air bags for space. Their customers are not buying a mode of transport, more a lifestyle. (These cars are in the same price range as a helicopter or condo.) They are time short, so need a system which is easy to learn and does not need a manual. And with such a long lead time they have to get the technology right or they end up out of date before they have even started building the car. Last up was Dr Farnaz Nichpour who I have seen speak before about research she did into London buses and how to make them more accessible. She touched on this research again this evening but then spoke about a new study she had worked on which looked at personal mobility and how it can affect people. Her key values from this research included how being able to use a car, motorised wheelchair or mobility scooter can make people feel normal and empowered. It can give them freedom to do what they want any time. They can help increase the users perception of health and fitness and can affect social identity. It was a fascinating evening which focused on the real UX issues of now in the automotive industry rather than fantasising about a future none of us can predict.